I have never been very good at knowing what type of skin care routine is best for me. On top of that, I have sensitive skin so I am often afraid to try new products. That’s why I used the same face wash and moisturizer for years and years! But then, I developed rosacea acne as an adult. When this started happening, I treated it like teenage acne and I tried to fix it myself. I went to the drug store to buy some acne washes and creams and thought that would fix it. After the acne washes and creams ended up making it worse, I finally decided to call my dermatologist. I have been a patient there for a long time because of my sensitive skin so I should have known better and went there first. But, you know… I was busy and thought I would find a quick fix at the drug store. After seeing my dermatologist at Trillium Creek Dermatology, I found out I had rosacea acne. That means that all the things I tried for acne flared up my rosacea and made it worse. (In other words, I should have made an appointment sooner). My dermatologist helped me get my acne under control with medicine for a quick(er) fix. However, she advised that I take preventative measures so that I wouldn’t need to be on medicine long-term. She advised that the best thing to do is to have a good skin care routine that works for my particular skin type. H&H Science Boutique is located in the Trillium Creek Dermatology office, so I headed over there to pick up the facial cleanser that my doctor recommended. In doing so I was thrilled to learn that they do skin consultations to help you discover the right skin care for your particular skin type. *Be sure to read all the way through this post to get a special offer on H&H Science products & services. I set up a meeting with Heather Funk who walked me through the 4 step process of the skin consultation. She was so detailed and informative in describing each product, the benefits, and why it would be valuable for me. Heather also explained the order in which each product should be applied. Then, she provided pamphlets and wrote all the steps down. That way, I was sure to have it right when I got home with the products. The really cool thing is that Heather and her mom, Helen, are the ones that have created the H&H Science product lines (note the reason for H&H, Helen & Heather). Heather is a beauty skin care expert. Her mom, Helen, is a nationally noted, board-certified dermatologist that has been practicing for over 35 years. She is truly an expert in dermatology and has been my dermatologist for years! I think it is so great that the H&H Science products are designed by women that are truly skin care experts! The products are all medical-grade. Which means that they contain higher levels of active ingredients and are therefore more effective than over the counter products. You can read more about their products on their website, here! I found tremendous value in having this skin consultation with Heather. As I mentioned, she helped me understand my skin type and find the exact products that would work the best for me. Raise your hand if you have bought products only to get them home and find out they don’t work for you. I know I have. So many of us have drawers or bags full of beauty products that don’t work for us. That’s a lot of wasted money. That’s why I see tremendous value in this service. You have an expert to help you find the right products. You also can feel confident in the product itself, knowing that it was designed by ladies that are experts! The big thing that I discovered in my consultation was that I am not wearing sun screen everyday and I really should be. We all should be. Especially those of us that have fair skin like me. H&H Science also has a make up line and they have a BB Cream that has sun screen SPF 50+ in it. After my consultation, Heather introduced me to Jenna who is the make up artist at H&H Science Boutique. Jenna showed me how to apply the BB Cream and applied my face make up for me that day. I was able to ask her questions about how to apply certain products as well as when and how to use them. Jenna is on the left and is the H&H Science Make Up Artist. Heather is on the right and is the beauty skin expert that does the skin consultations and is the co-founder of the H&H Science Product Lines. If you are like me, and are not an expert at make up, I think you will find that part of the consult very helpful as well. I was so pleased with my experience of the skin and make up consultation! Having a make up line means that H&H Science Boutique can be your one stop shop for skin care and make up. I know you will discover that everyone there are extremely helpful and informative. 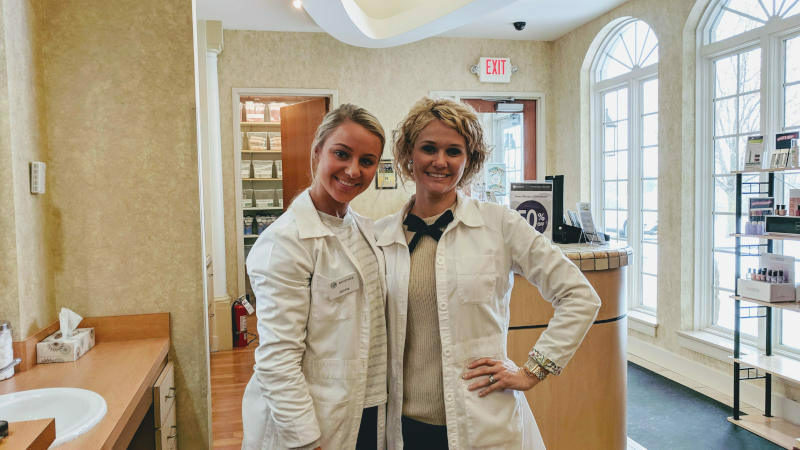 To learn more about H&H Science Boutique or to schedule an appointment for a skin consultation, head over to their website or give them a call at 330.722.5477. They have locations in Medina and Wooster and one opening this Spring in Wadsworth! **Until the end of February, H&H Science Boutique is offering Akron Ohio Moms Readers a complimentary skin care consultation with make-up application and/or a 30% off your entire purchase (one time use)! Be sure to mention Akron Ohio Moms to get this special! Amanda is a wife and a mom. She loves coffee and everything pumpkin spice (especially together!) She is also a Financial Coach that is a spender at heart. She has found a way to balance spending and saving and she shares all the details on her personal finances + lifestyle blog at AmandaSharratt.com. This entry was posted in Beauty, Personal Care, Product Reviews, Reviews & Shopping and tagged healthy skin, skin health, Skincare.